There’s now a reason to be excited if you happen to have a Nintendo Switch, and want to do more than play Zelda and show it off at parties then. Once the console finally made it into reviewers’ hands, it was discovered that the Nintendo Switch’s Joy-Con controllers also worked with PCs and smartphones as a standard Bluetooth gamepad. That’s wonderful and not at all unexpected for a controller that communicates via Bluetooth. But starting today, it can also be used with the equally tiny NES Classic Edition using 8Bitdo’s wireless retro receiver adapter. 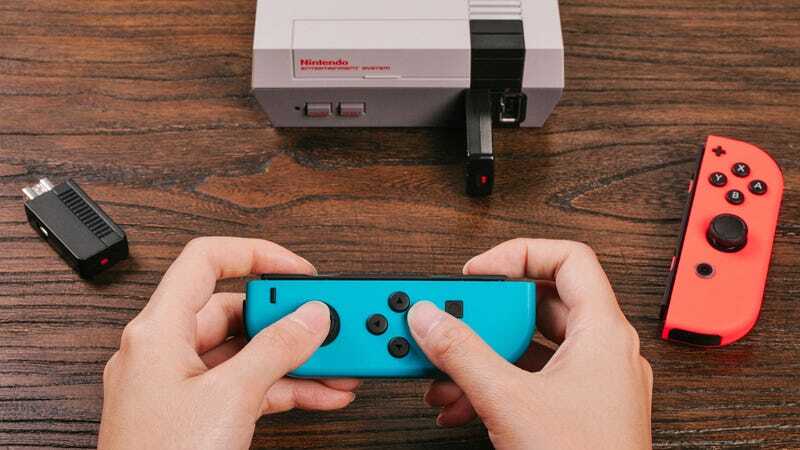 The $17 adapter that allows Bluetooth gamepads to be used with the NES Classic Edition has been available since mid-December, but today 8Bitdo is releasing a free firmware update that ensures it can also connect to the Switch’s wireless Joy-Con controllers too. The tiny Joy-Cons might not be the ideal way to play your favorite 8-bit titles, but they can be considerably more comfortable than the NES’ original boxy controllers, and you won’t have to deal with the impossibly short cord that came on the NES Classic Edition’s bundled controllers. Today’s firmware update also allows the Nintendo Switch’s pricey Pro Controller to be used with the NES Classic Edition. So if you’ve already coughed up $70 for the upgrade, you can can feel slightly less guilty about all the money you’ve already spent on video game gear this week. Is the Nintendo Switch Worth it Yet?